The 3rd United Nations Environment Assembly (UNEA-3) whose theme focused around “pollution,” was celebrated from December 4-6th, 2017. Several activities prior to UNEA-3 happened the week before, starting with the Global Major Groups & Stakeholders Forum (GMSF) from Nov.27-28th; followed by the Science-Business-Policy Forum from Nov.29-30th; then, from Dec.1st to Dec.3rd, the 3rd the Open-Ended Committee of Representatives (OECPR) (which is composed of all accredited Permanent Representatives to United Nations Environment Program (UNEP)), which is in charge of preparing the meetings of the UN Environment Assembly and regularly reviews the implementation of its decisions. Most Resolutions proposed for endorsement at UNEA-3, start being negotiated months in advance. 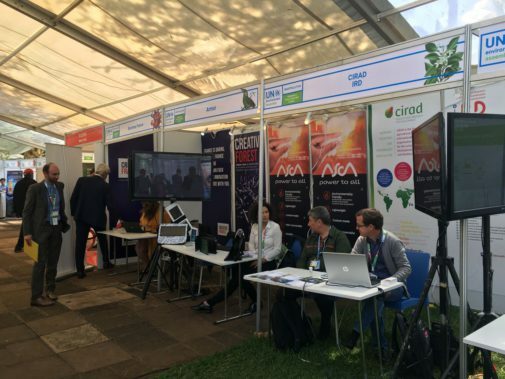 While most other UN conventions/treaties have been ongoing for several years, UNEA is a relatively ‘new’ process emerging from decisions at Rio+20. As it unfolds, it gains more global attention and begins to be recognized as an important driver of the environmental pillar of sustainable development, key for the accomplishment of the Sustainable Development Goals (SDGs) at the heart of the UN’s General Assembly Agenda 2030. In fact, 4 of the adopted Resolutions at UNEA-3 are directly related to the SDGs/HLPF, while a Resolution on Mainstreaming Biodiversity made a clear link with other very relevant and important process: The Convention on Biological Diversity (CBD). Certainly, such synergies are very urgently needed in the multilateral policy agenda. However, a different kind of similarity is evident in many of these environment-related UN policy fora: the so-called ‘corporate take-over’ of the UN, which goes in hand with the closing space for civil society engagement. And UNEA is not an exception. Despite some important aspects of pollution acknowledged during UNEA-3 and its associated events, the final outcomes leave one thinking whether ‘beating pollution’ is going to happen soon, or even at all. The language throughout numerous Resolutions was significantly watered down, many times with the “aid” of the United States delegation. For instance, the Resolution on soil pollution management includes a very awkward reference to ‘improper’ use of pesticides. If governments were really committed to #BeatPollution in a short time span, ALL pesticides would need to be phased out and pest management – and overall industrial agricultural models – would need to transform towards more environmentally friendly practices that do not include harmful chemicals and that takes into consideration organic farming including agroecology and permaculture, among others. Sustainable Innovations EXpo (business marketplace). Isis Alvarez/GFC. Moreover, none of the UNEA Resolutions legally bind governments to fulfill them but, like in other fora, its compliance is expected on a voluntary basis. At a UNEA-3 press conference on ‘Challenges facing women’s environmental rights defenders’, Priscilla Achakpa from the Women’s Major Group stated that “Pollution is not incidental but is a deliberate and inevitable consequence of a profit-oriented economy of mass production of harmful plastics, pesticides, and fossil fuels”. If beating pollution would be a priority for UN Member States, efforts to address it would focus on tackling the source of man-made pollution but profit-making, unfortunately, has beaten environmental health and human rights. 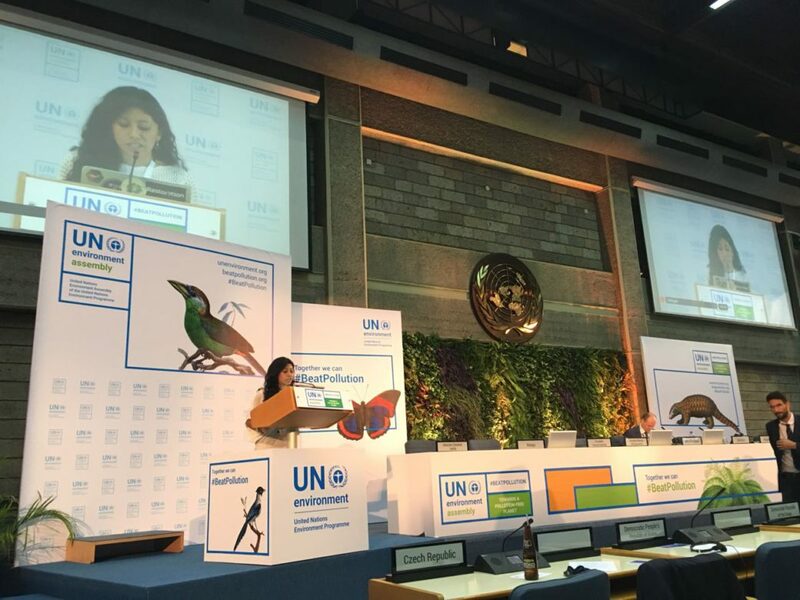 At this round of UNEA, it was clearer that it has become a new niche for businesses looking to increase revenues at the expense of people and the planet, running the risk of turning into what the climate (talks) marketplace has become. Therefore, UNEA-3 outcomes still allow dirty industries to continue to pollute aggravated by the fact that Mr. Erik Solheim – UNEP’s new Executive Director – is a strong supporter of private companies to the point that, among the many corporations he quoted, he dared to quote Shell & Walmart as ‘good examples’ of businesses doing the ‘right thing’. In the meantime, at the opening of the 3rd OECPR, Mr. Solheim linked civil society groups to ISIS terrorists. These unfortunate declarations were met with disappointment and full rejection from a wide range of civil society organizations that have been following different UN processes and dedicating their lives to making the world a better place. Many of the organizations that are accredited to the different UN agencies/organisms, work directly with people who have been murdered and/or criminalized for defending an environmental cause. Such declarations can only put this people in more danger and help delegitimize their right to defend their land, resources, health and livelihoods. Not only did he ignore what the role of Major Groups is and Stakeholders in this Assembly (and other UN multilateral processes) but he also failed to recognize that it is not just up to businesses to #BeatPollution. To add insult to injury, OECPR Chair John Moreti from Botswana, also failed to understand who were the actors playing a role in the same meeting he preceded when confusing UN Women with the Women’s Major Group. No wonder why this round of UNEA didn’t have its usual core budget for civil society participation. Unfortunately for UNEP, its track record as the lead environment authority has been dampened. Previous EDs at UNEP had a clear scientific and policy background that put UNEP’s work in the spotlight and helped the agency establish its reputation. Mostafa Kamal Tolba (1975-1992) brought people together to achieve the widely acclaimed Montreal Protocol – the historic 1987 agreement to protect the ozone layer; Liz Dowdeswell (1992-1998) is currently the President & CEO of the Council of Canadian Academies, an organization that provides independent evidence-based scientific assessment of matters of public policy; Klaus Töpfer (1998-2006) reached the Cartagena Protocol on Biosafety, which addresses issue of genetically modified organisms, and the Stockholm Convention on Persistent Organic Pollutants, and was also involved in behind-the-scenes negotiations in support of the Kyoto Protocol. But as rightfully pointed out by a member of a civil society organization that has been engaged with UNEP for several years, all those years of efforts placed in the evolution of the policy-science interface seem to have been replaced with a reductionist and weakening view where no social scientists are involved and where policy is only left to governments forgetting where policies really come from. In 2006 when Achim Steiner took office, he changed the course of UNEP by strongly focusing its work around the ‘Green Economy’. He received numerous awards but failed to keep up to the integral achievements from his other predecessors. The Green Economy was supposed to be his flagship “save nature” project but at its core it promoted the principle that: to value nature, you needed to put a price on it, which was used as a basis to establish baselines for new markets of nature. Blue carbon, brown carbon and even the seeds of climate smart agriculture all came from there. Thus, he opened the way for the private sector to influence UNEP policies, for instance, during the Science & Policy Forum (not business) around UNEA-2, members of civil society were shocked when the Women in Science Award went to a professor well-known for her work on genetically modified maize varieties, advisor to the biotech-funded Council for Biotechnology Information in the US and on the board of AfricaBio, an organization funded by Monsanto that lobbies for GMO crops in Africa. Certainly, in beating pollution the private sector needs to play an important role but not in taking over the role of an institution whose mandate doesn’t fall in the promotion of private companies escorting them from being held accountable from the numerous environmental and social disasters they have caused due to their unsustainable practices. Ignoring the key role of civil society condemns us to continue to drown in our own man-made pollution and excluding us from solutions; indigenous peoples, local communities, women’s and youth groups, citizens initiatives, among others, have shown the power of the people and deliberately leaving us ‘outside the room’ is irrational. It seems like the new normal in all UN institutions is to let businesses rule the fate of humanity exempted from any social and environmental responsibility. Note: The assembly also passed 13 non-binding resolutions and three decisions. Among them were moves to address marine litter and microplastics, prevent and reduce air pollution, cut out lead poisoning from paint and batteries, protect water-based ecosystems from pollution, deal with soil pollution, and manage pollution in areas hit by conflict and terrorism. At Rio+20, UNEP was upgraded and given universal membership meaning that around 193 governments members to the UN, can now participate of discussions around UNEP. At the Governing Council in 2013, the decision was to have a bi-annual Assembly replacing the GC meetings.